The most obvious reason to be using multiple monitors is to enable multitasking for your employees. If there is more screen space to view, they can accomplish more or make certain tasks easier to perform. Multitasking may be difficult with just a single monitor, and anyone who’s tried to research a topic and apply this knowledge in a separate tab or document knows this pain all too well. Employees can have their email up on one screen at all times so they can stay connected to the office, while working in another tab. With multiple monitors, the number of tasks you can accomplish is only limited by how many monitors you can connect to your computer. Plus, if you’re using a laptop, connecting an external monitor is easy enough, as long as your laptop has the ports required to do so. 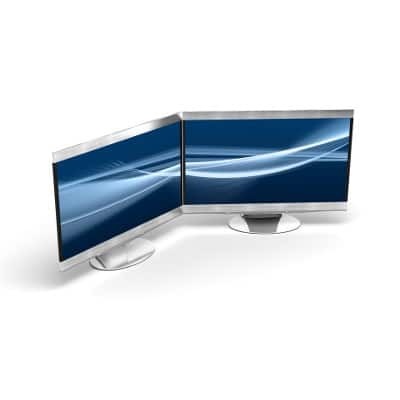 This makes using multiple monitors versatile to suit the needs of your business. Even mobile devices can take advantage of this to a certain extent with technologies like Google Chromecast. Or, instead of having your email pulled up on your desktop workstation, you can use your smartphone to keep tabs on your messages, freeing up even more space. The most immediate disadvantage to equipping all of your business’s workstations with multiple monitors is the upfront cost. Like other computing hardware, monitors (especially good, reliable ones) aren’t cheap. Furthermore, you need to consider how much room that your monitors will take up on your employees’ desks. Then there’s the matter of distractions that come from too many monitors. Do you have employees who would rather watch YouTube videos than do their work? Multiple monitors allow them to do both, which may decrease the quality of their actual work. While it will look like they’re being productive on the surface, it’s really could just be a facade to cover up the fact that they were only paying half-attention to their real task. Of course, not all employees will do this, but it’s your responsibility to ensure that your team is well-educated on how to best utilize their multiple-display workstation (a content filtering solution from K² Technologies can help). If your business has trouble procuring the proper technology for your employees, then give K² Technologies a call at 307-686-3025. We can help your business better leverage your budget to allow for greater flexibility. For more information, give K² Technologies a call at 307-686-3025.